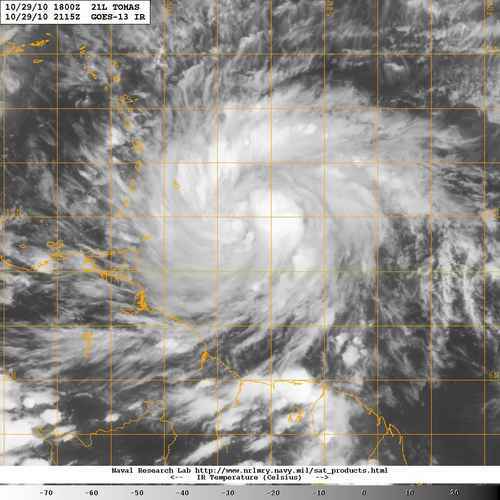 GOES satellite view of Tropical Storm TOMAS on 29 October 2010 at 1715 EST as it moved toward Trinidad & Tobago, Barbados, the Lesser Antilles and the Caribbean beyond with sustained 40 mph winds. The large tropical wave we have been following as it grew more organized, stronger and bigger over the past couple of days off the coast of South America (Guyana, French Guiana) has morphed into Tropical Storm TOMAS the 19th named tropical cyclone of the 2010 Atlantic Hurricane Season. Tropical Storm TOMAS is a large – approximately 700 miles in diameter – tropical cyclone that is drawing large amounts of atmospheric moisture from as far back as the eastern Atlantic and from the eastern Caribbean. This storm could grow even larger as it enters the warm waters of the Caribbean and feeds off the moisture lingering over Central America and the eastern Pacific. The storm may become a hurricane in the next 24 – 48 hours as it enters a more favorable environment and gets farther away from the landmass of South America. Given the warm waters of the Caribbean, the amount of atmospheric moisture over Central America and the eastern Pacific in that region, plus the absence of any significant wind shear it is possible that Tomas may grow into a strong category 2 or even a major hurricane early this coming week. Color-enhanced infrared-filter GOES satellite view of Tropical Storm TOMAS off the coast of South America on 29 October 2010 at 1645 EST. Notice how the cyclone is drawing atmospheric moisture from as far back as the eastern Atlantic and Hurricane Alley. All interests in the Caribbean basin including Panama, Central America, the Antilles, and the Yucatan Peninsula need to monitor the progress of this tropical cyclone closely in days to come, for it not only is quite large, but it may grow into a major hurricane if conditions remain favorable for further cyclonic development. Florida and the Bahamas also need to be alert especially as the storm gets closer toward the end of next week. Projected track for Tropical Storm TOMAS as of 29 October 2010 at 1400 EST developed by the Navy Research Laboratory based on NOAA observations and data. Notice how the 'cone of uncertainty' widens as of Tuesday of next week. Color-enhanced infrared GOES satellite view of Tropical Storm TOMAS on 29 October 2010 at 2145 EST showing a tighter more compact storm than earlier today (compare this view with similar picture above taken 5 hours earlier), a clear sign of intensification. Satellite pictures show Tropical Storm TOMAS has gotten much better organized and stronger over the past few hours. Reconoissance flights and satellite data show the eye has reformed a bit to the north of its original location and convection has intensified around all quadrants, but especially to the west of the eye were quite intense rain is taking place tonight. As of 2200 EST maximum sustained winds were at 65 mph (104 kph) and movements continued to be WNW at 16 mph (26 kph). Conditions ahead, in the Caribbean, appear favorable for further intensification with some models forecasting a potential category 3 tropical cyclone in 72-96 hours. Caribbean surface waters are a bit warmer than those in Hurricane Alley, which added to rain and storm cells near Panama ahead of Tomas’ track provide ‘fuel’ sources for an intensifying storm. The Lesser Antilles will bear the brunt of the storm over the next 12- 24 hours. Other Caribbean basin nations, including Puerto Rico, Costa Rica, Nicaragua, Honduras, Dominican Republic, Haiti, Jamaica, Cuba need to brace for impact in the next 36 – 72 hours. Belize, the Yucatan Peninsula, Grand Cayman should feel the effects 96 – 120 hours from now and beyond.